You are at:Home»Force Structure Review»Is a new Marine command coming to Bahrain? If you browsed Marine Corps Times’ website today, odds are good that you saw my story about the Corps launching two new Marine expeditionary brigade headquarters capable of leading joint task forces in times of crises. Most of the information comes from an interview last month with Lt. Gen. George Flynn, deputy commandant for combat development and integration. As head of the Marine Corps Force Structure Review, he’s one of the few Marines around right now in position to describe some of the heavily anticipated changes expected as the Corps resets for life in the 21st century. Flynn said the Corps has begun to develop new, one-star MEB headquarters that will be called on in times of crises to lead joint task forces. Forces will be called on as necessary, with one MEB falling under Marine Corps Forces Central Command and the other falling under Marine Corps Forces Africa Command. Combined, those two regions cover most of the world’s unstable countries. There’s at least one thread that isn’t clear, however: While officials acknowledge the plan is to base the MARCENT MEB at MARFORAF headquarters in Germany, they are more tight-lipped about the plan for the one in MARCENT and U.S. Central Command. The guidance also said Marine leadership had decided to “establish one or more one-star level JTF headquarters within the combatant commands” while ensuring the rest of the Corps received adequate resources. 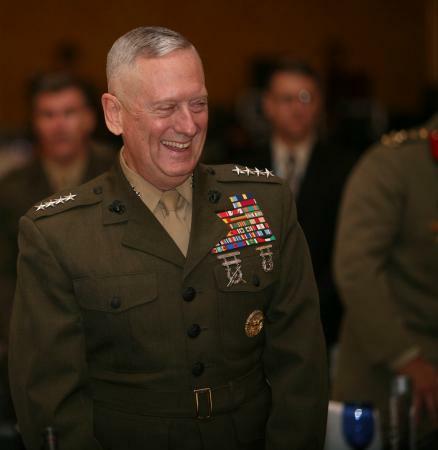 CENTCOM, commanded by Gen. James Mattis, is based at MacDill Air Force Base in Tampa, Fla. So is MARCENT. There are other MARCENT elements in Bahrain, however, and a company of Marines with Fleet Anti-Terrorism Security Team is based there to assist in embassy reinforcement and other missions that are needed in CENTCOM’s area of operations. Adding to the intrigue, it was expected that Brig. Gen. Brian Beaudreault, the Corps’ deputy director of MARCENT, would be stationed in Bahrain, according to a newspaper report written from his promotion ceremony last summer. The event was attended by Assistant Commandant Gen. Joseph Dunford. Regardless of the outcome, it appears the Corps will put an increased emphasis on getting to crises first, something that already was a strength due to the service’s Marine expeditionary units. It’ll be interesting to see how all this plays out in coming months. Do we now expect a more robust backing of Al-Khalifah ruling family against the helpless people of Bahrain. Surely America knows of the brute human right abuses carried out under its nose and chooses to keep silent whereas it has been vocal and taking action when it comes to Gadhafi and Assad. Unbelievable. Does this now explain why the US has been so mum about the slaughter the ruling Sunni thugs, with their Saudi partners, have been inflicting on the Bahraini protesters? Surely the Military Times can do better and ask the really critical question herein…. Would the US really be so “dumb” as to stick Marines right into the middle of yet another brewing civil war? as sitting ducks, much as they once were in Lebanon? William, you DID catch the part where we reported that there already are Marines in Bahrain, and have been for years, right? This wouldn’t exactly be a first. There also are thousands of sailors stationed there. Indeed Dan. But the focus of THIS report is on a “NEW” Marine command being considered for Bahrain. The ironies within your report are stunning…. talk about “getting to crises first.” (how ’bout back yard) Worst possible signal US could send right now (esp to Iraq and Iran) would be to do anything so tin-eared…. By contrast, the idea of inserting a new Marine command into Bahrain at this particularly delicate juncture would be the height of folly. I think the point you made about signals being sent is relevant here. A reasonable man would probably wonder why the planned location of one MEB headquarters has been acknowledged, but the other one hasn’t. Clarifying point: There already are plenty of Marines on that naval base. As noted above, the Corps bases its FAST company for CENTCOM there. It has a similar set up at the Navy base in Rota, Spain, where the FAST Company responding to events in AFRICOM and EUCOM is based. That means dozens of permanent personnel, plus platoons of Marines rotating through on a six-month rotational basis. Do you live in Bahrain? Were you here during the so called “slaughter of Bahraini Protesters? I doubt it and would wager that you are highly “informed” by the likes of CNN & BBC. I am a Western expat and have lived in Bahrain for the last 10 years. I have become accustomed to driving home from work having to weave in and out and around burning tyres on the streets, street lights cut because the electrical distribution box has been set alight or melted traffic lights over the past several years and which were permitted as “peaceful protests” however when these protests elevated to the point of choking the economy, preventing and intimidating non-participants from going about their normal lives, action was necessary. I cannot for one moment imagine the authorities of any country in the world allowing the voice of a few (not all Shia supported the protests and level of disruption) to bring the whole economy to a standstill. As for the slaughter you refer to, yes I would have to agree that a very heavy hand (and buckshot) was used but these were not unarmed protestors as widley reported nor were Dr’s and nurses randomly attacked by the police in the hospitals. There is video footage available clearly showing ambulances arriving at the fringe of protests (read: riot) and distributing swords and missles from the back. These same people then cry foul when they are arrested fro their crimes and hide behind the badge of medical impartiality. If you do live in Bahrain and did witness the attacks on the nation then I really have nothing else to say except that you have a different view on life than myslef. I wish you well but please keep your narrow views to yourself and trade on facts not your emotions. It seems like a lot of you are against what is happening in Bahrain, but the question is, Do you really know what is going on in there? I am a Baharini citizen and I’ve witnessed everything,, All you read and hear about in the news is fabricated and made up stories,, yes, alot have been detained and beaten. But you should know that 80% of the whole pouplation are living a normal life and everything is going well.. They just love to make a big fuss. No government is perfect, but ours is not a tyrant. So please, know the truth before you pass a judgement.